Thin, translucent, gelatinous noodles made from the starch of a yamlike tuber known as Devil’s Tongue. Shirataki, which are the shredded form of konnyaku, have no discernable taste but absorb the dominant flavors of the soup or dish to which they’re added. They can be found both in dry and soft forms in Asian markets and some supermarkets. 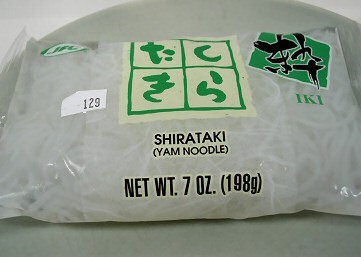 The word shirataki means “white waterfall,” alluding to the appearance of these noodles. Shirataki have become very popular with low-carb dieters because they contain almost no carbs or calories. There are basically two forms of them available, one just the plain noodles made of konnyaku and another that combines konnyaku and tofu and is available in different styles (fettucini or noodle, for example). Both are low in carbs, but the tofu version has added protein and a few more calories. The package I bought was the plain kind, packed in water, and the package indicated that for a 2.8 ounce serving, there were no calories and less than one gram of carbohydrate (though I fail to see how anyone could eat only 2.8 ounces and be satisfied). When you open a package of shirataki, you may notice a characteristic (i.e. bad) smell. This smell disappears as long as you parboil the noodles before using them. I wasn’t taking any chances, so I first rinsed the noodles and then boiled them in water to which I added soy sauce and a dash of sesame oil. They boiled for two minutes and sat in the cooking water until I was ready to add them to the recipe. (Unlike regular noodles, they don’t get soggy from sitting in water too long.) I’m happy to report that they tasted fine–if you consider “fine” to be that they had no taste at all. 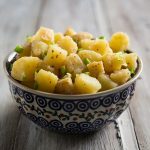 But once I added them to the rest of the ingredients, they did pick up the hot and sour flavor of the dish, and we actually liked them very much. 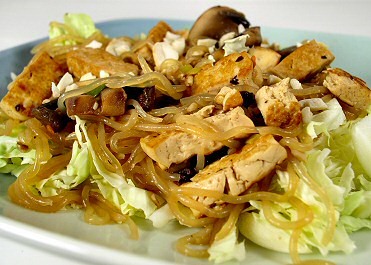 NOTE: You can make this with regular thin noodles, such as buckwheat soba or angel hair pasta. Just make the noodles according to package directions and then add them at the end of the recipe. Drain and rinse the shirataki noodles and place them in a saucepan with the water, soy sauce, and sesame oil. Bring to a boil and cook for 2 minutes. Remove from the heat and set aside. Toss the tofu cubes with the 1 tbsp. soy sauce and 1/4 tsp. sesame oil and set aside while you heat an oiled non-stick skillet or wok. When the skillet is hot, lift the tofu from the marinade and pan-fry it until it is lightly brown on all sides. Remove it from the skillet and place it back in the bowl with the marinade. Stir gently, and set aside. Add the remaining 1 1/2 tsp. sesame oil to the pan. Over medium-high heat, stir fry the red pepper, garlic, green onions, and mushrooms until the mushrooms start to exude their juices. Add the lime juice, 3 tbsp. soy sauce, and sugar, and stir well. Continue stir-frying until the mixture boils. Drain the noodles and add them to the pan, along with the tofu and its marinade. Toss well to mix. 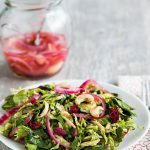 Serve on a bed of shredded cabbage and sprinkle with chopped peanuts. 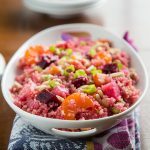 My husband and I really enjoyed this, but it was a little too hot and too sour for our daughter, so no kid-friendly label for this recipe, I’m afraid. It worked out well for us, though: Since this dish was our entire meal, dividing it into three servings would have left us all a little hungry, but this was just the right size for two adults with big appetites. I will definitely be using shirataki noodles again. Update: Take a look at my other shirataki recipes: Shirataki Noodles with Tomato Pesto, Orange-Ginger Tofu on Shirataki Noodles, and Brussels Sprouts Go Asian. The "House Foods" brand of shirataki tofu noodles ARE vegan…please make sure everyone knows that. …forgot to mention…this recipe is awesome! You can get different varierties at miraclenoodle.com Try the orzo, its great! Do you know what the total calorie count for this recipe is? it looks amazing! i’ll be trying it out tonight. i made this last night, and it was AMAZING! thank you so much for the recipe!! when running it thru the calorie counter i got total calories of 229. i did substitute a couple things. i didn’t have cabbage, so i used bok choy. i also used asparagus instead of green peppers. DELICIOUS! I’m glad it worked out for you! I meant to get back to you about the calories, so I’m glad you were able to figure it out. I’m a little surprised that it had that many, but I know it would be a whole lot more with regular noodles. I made this tonight and my husband and I liked it a lot! I had been leery of trying shirataki noodles, but they are quite good in this recipe! I added red pepper with the mushrooms and sprinkled cilantro on top. I love shirataki noodles nom nom. I’ve used the fettuccini and spaghetti style both in my stir frys. I just open the bag and rinse them off and once my stir fry has been cooking good for a bit I toss them in. They soak up the flavor really good! They def do smell really bad when you first open the bag lol. I made this last night and it was SO good!!!!!! I used red pepper flakes (I didn’t have any Chinese chili sauce) and Stevia instead of sugar.SO YUM!! 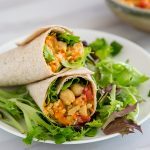 Awesome recipe – Thank you! Amazing recipe! I found this in the archives lol. I was trying to find a good use for my Shirataki Noodles- I bought them for the fiirst time and didn’t have a use for them! This was perfect! Your recipes never disappoint!